It sounds clichéd and somewhat sappy, but it does bear repeating that children are our most vulnerable citizens. 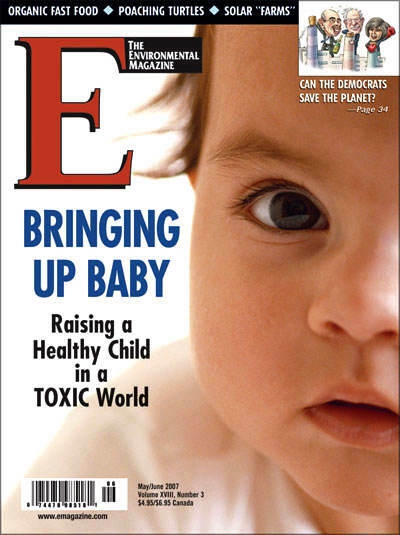 In fact, it was the impending birth of our first son in 1988 that played heavily into our decision to start E Magazine. We were looking to move on from another nonprofit media venture, and we were at a local breakfast place on our way to work. Over bagels and coffee we were reading New York Times stories about medical waste washing up on New Jersey shores, fires in Yellowstone National Park and that year’s "Greenhouse Summer," describing what we all now know to be one of the effects of global warming. It was our first realization, as new parents-to-be, that we really were going to leave a terrible legacy for future generations if we didn’t do something about mounting environmental problems. Sentimental or not, I often think about how crucial it is to consider our youngest when weighing important issues. If you’ve read this page often you’ve heard me go on about the 35,000 children globally who die every day (one every three seconds) from air- and water-borne diseases and water and food shortages—and about the horrible and related economic inequalities that only worsen each day around the world, largely due to neglect. Despite these frightful conditions, I often hear people and news pundits dismiss the plight of the poor and destitute as simply the result of their own lack of ambition and therefore not worthy of our attention. Not worthy of welfare or affirmative action programs or higher minimum wages that might help them rise up and out of a vicious cycle. Not worthy of the financial aid that might enable their crippled economies to better serve their needs. Or not worthy of coming to America, where opportunities might be greater. Instead, many seek to close our borders and force them to deal with their own problems. But how often do we consider the plight of the children of the people with whom we choose not to sympathize? Can they be blamed for the circumstances that cause them to live in such abject poverty, to have no safe food or potable water? Bringing it home to issues we struggle with day-to-day in the U.S., did our children create the conditions that resulted in the toxic fumes, chemicals and mercury pollution in the environment that cause their asthma, childhood cancer and autism? When we propose cutting $100 million from food subsidy programs for the poor, do we stop to think about the children of these low-income families who will go hungry? And when we allow our medical-industrial complex to effectively deny affordable healthcare to millions of our citizens, do we consider that children are many among those who may have to go without needed treatments? It’s "easy to be hard," proclaimed a 1967 song from the musical, Hair (later popularized by the pop group Three Dog Night). Not so easy, though, when one considers the youngest victims.